Street soccer is played anywhere in the world where two or more people have space and a ball. Competitive street soccer is played on a surface similar to a tennis court but with walls to keep the ball in play. Games are 14 minutes, fast paced, high scoring and fun. 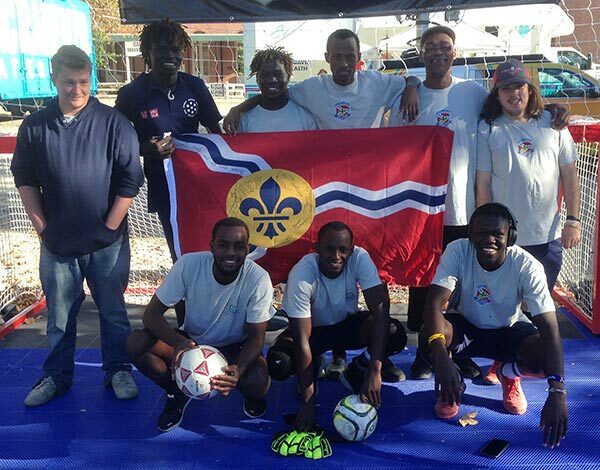 The St. Louis Roadies are a street soccer club formed 11 years ago for men and women in St. Louis who are homeless, formerly homeless or newly arrived to America as political refugees and/or immigrants. Sponsored by Peter & Paul Community Services in St. Louis, the Roadies are a Sport for Social Change Program. Players utilize street soccer to remain sober, find housing, land jobs, pay off debt, access health care, navigate the legal system, attend college, reconnect with family and, most importantly, create meaningful friendships. St. Louis Roadie players will tell you that being part of the club has inspired them to make lasting improvements in their lives. Open practices are held on the last Friday of the month for adults 18 and over beginning at 6:30 p.m. Call 314-662-2877 for more details. Take Jefferson south to Wyoming and you’re there. A major bus line drops you off in front of the building.